From Medicom. A PREVIEWS Exclusive! 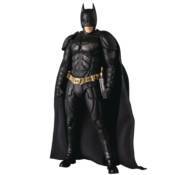 Batman from The Dark Knight Rises is Medicom's MAFEX Batman Ver.3.0! He stands about 6 1/2' tall with an all-new sculpt and is insanely posable for maximum action! He comes with three facial expressions and his grapnel gun, a Batarang and two rifles! Multiple interchangeable hands are also included. Don't miss out, order this iconic hero today!